These Double Chocolate Chip Pudding Cookies are ultra soft and thick and the “secret” ingredient is pudding mix in the batter! 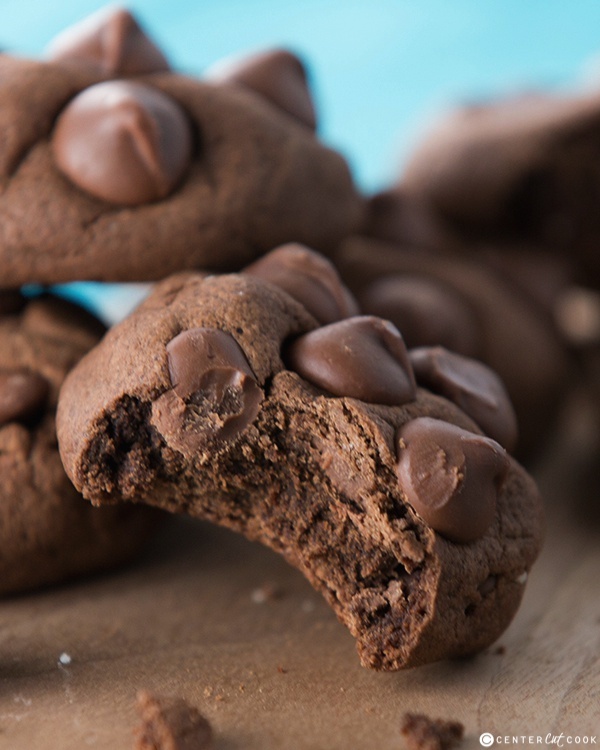 Easy to make and loaded with chocolate chips, you might call these one of the softest cookies ever! Chocolate chip pudding cookies seem to be all the craze lately on Pinterest. I came across so many different cookie variations that use pudding mix that I decided to see what all of the fuss was about and came up with my own variation. Because it’s impossible to have too much chocolate in a recipe I decided to make Double Chocolate Chip Pudding Cookies. 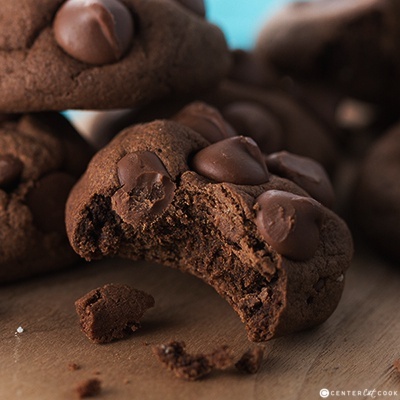 The chocolate cookie base is loaded with chocolate chips, and the chocolate (or vanilla) pudding mix makes these cookies ultra soft and super thick! The key to using pudding mix in the batter is that you have to use instant pudding mix. The heat and serve kind and the sugar-free version won’t work in this recipe, so double check that you’re buying the instant mix. You don’t actually make the pudding as instructed, you just sprinkle the dry pudding mix into the batter. The trick to getting your cookies to look like mine is to press chocolate chips onto the outside of each cookie dough ball before you bake them, that way when they come out of the oven you’ll have chocolate chips sitting on top. I almost always buy Ghirardelli chocolate chips, it’s just a personal preference. In a large bowl, sift together flour, cocoa powder, and baking soda. With your mixer, cream together butter, brown sugar, and granulated sugar. Add in the pudding mix and combine well. Slowly add the flour mixture into the wet ingredients and mix until well combined. Roll about 1 and 1/2 tablespoons cookie dough into balls and place on a baking sheet. Press additional chocolate chips onto the outside of the cookie dough ball if you wish. Bake for 8-12 minutes, or until the cookies are set.